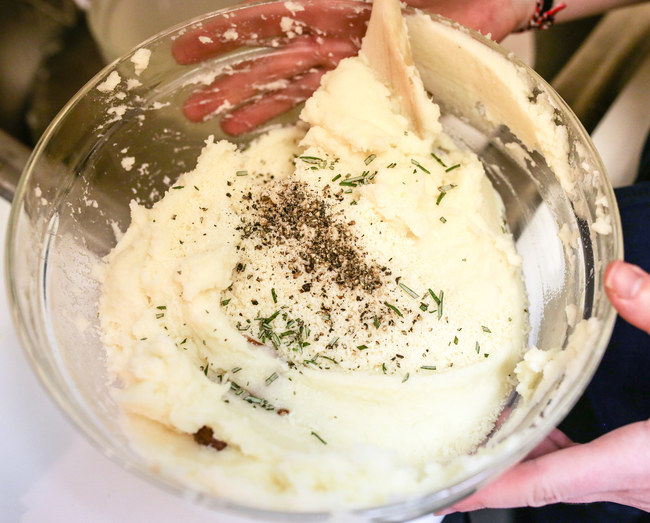 Mashed potatoes are standard Thanksgiving fare, in line with the turkey, the stuffing, and the apple pie. So despite my best efforts to do away with them sometimes in favor of some equally delicious alternatives (see our Cauliflower Puree and Potato Dominoes recipes), there would be a mini rebellion in our house if mashed potatoes weren’t on the table. 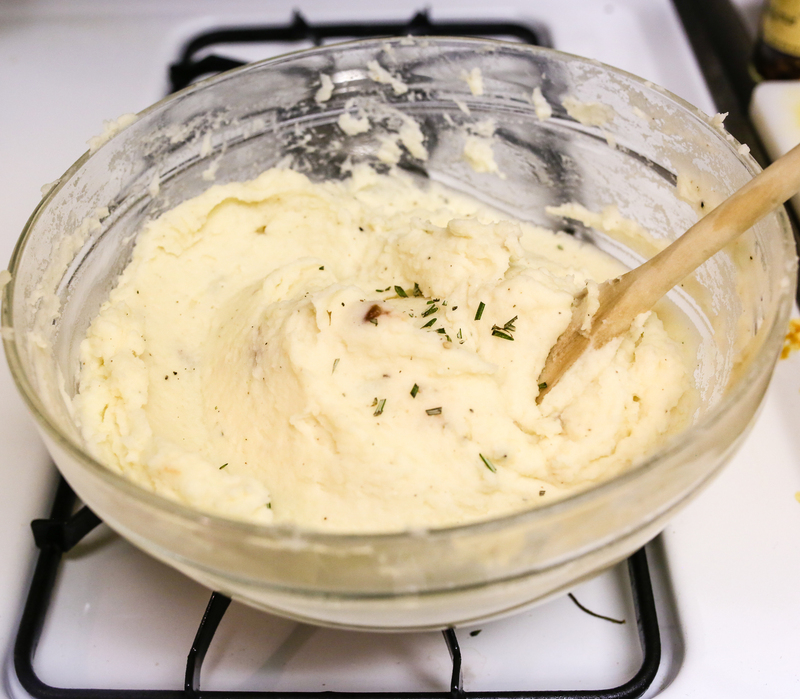 Mashed potatoes are like a blank canvas, ready to accept anything and everything that you throw at them. 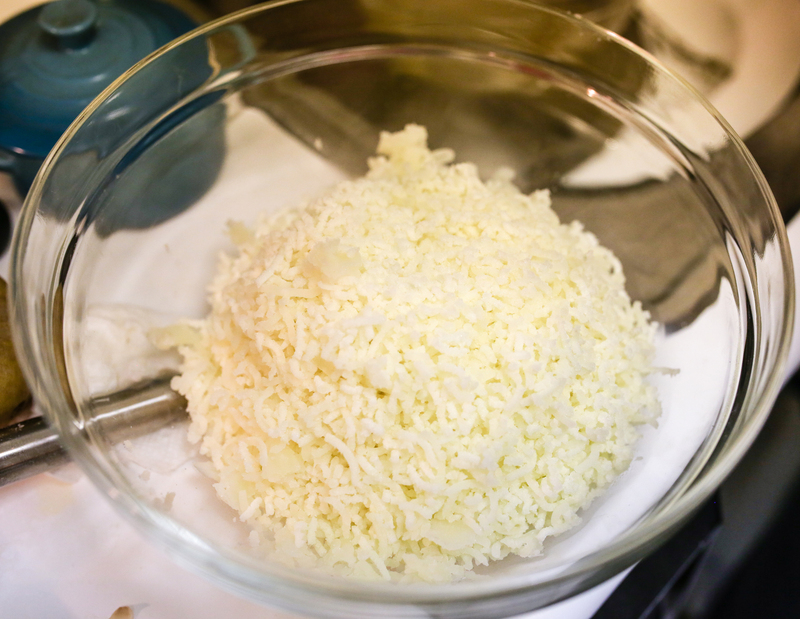 From sour cream to chives to cheddar cheese to garlic, you can really add just about anything to the mix. This recipe combines some of our favorite flavors into one smooth, creamy, flavorful side dish. 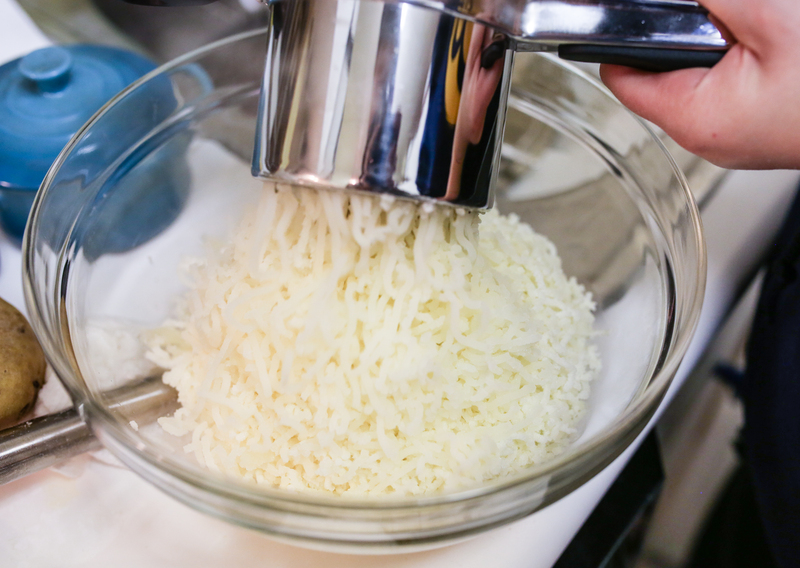 Feel free to take liberties with the recipe by adding more milk, omitting the cheese (or doubling it, as we did! ), substituting the butter for more olive oil…you get the point! This dish is all about your personal preferences and tastes, so we encourage you to taste as the dish is coming together and adjust the dish as you see fit. Place garlic in small ovenproof bowl, and drizzle with olive oil. Roast for 30 minutes, or until very soft. Cool and peel the garlic, and reserve the oil. 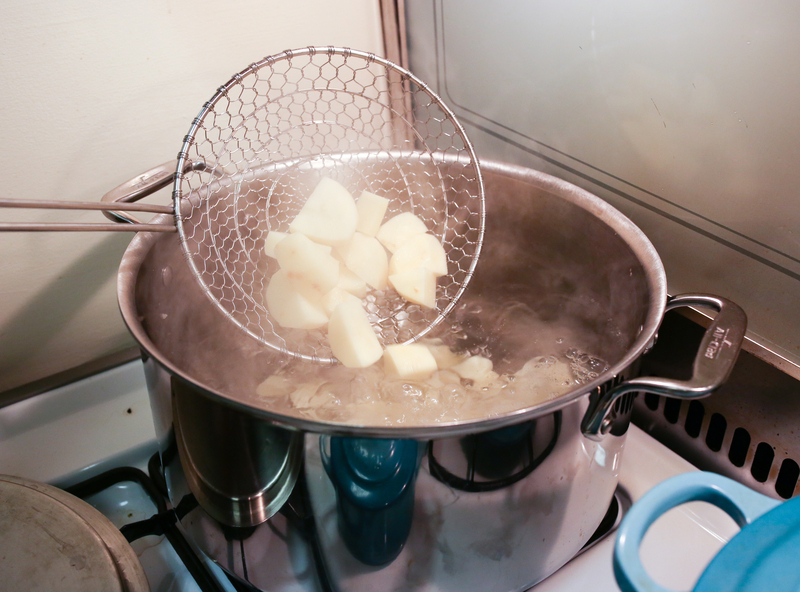 Boil potatoes and 1 sprig rosemary in a large pot of salted water until tender, about 20 minutes. 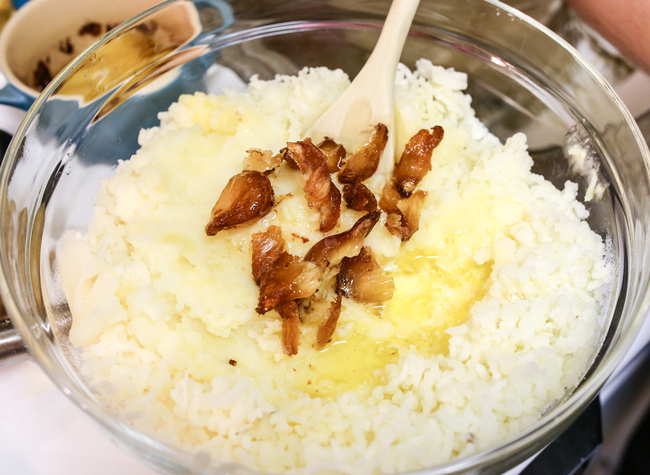 For smooth potatoes: Run potatoes through a potato rice into a large bowl. Add ½ cup milk, ¼ cup butter, garlic, and reserved olive oil. Add reserved cooking liquid and more milk and butter as needed. 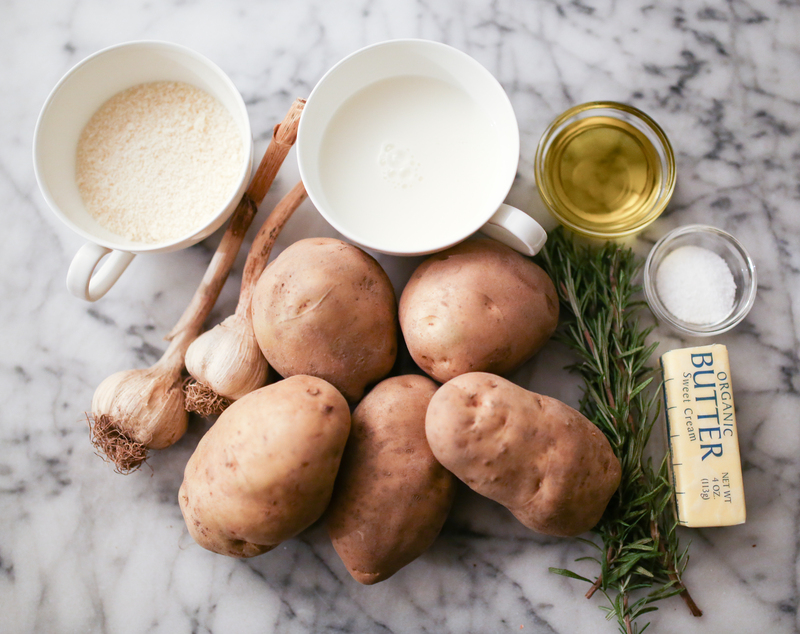 For chunky potatoes: Add potatoes to a large bowl with ½ cup milk, ¼ cup butter, garlic, and reserved olive oil. Mash to desired consistency, adding reserved cooking liquid and more milk and butter as needed. Mix in ½ cup cheese. Season with minced fresh rosemary, salt and pepper all to taste.